Shirts With Random Triangles: Brian Bosworth says Oklahoma football has lost its bite. 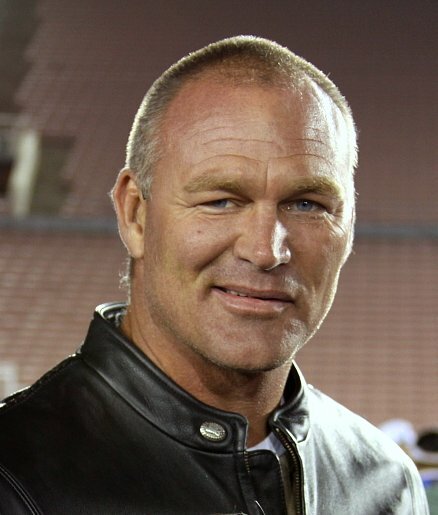 Brian Bosworth says Oklahoma football has lost its bite. The Tulsa World interviewed Oklahoma football legend and legendary NFL bust Brian Bosworth recently in conjunction with the premiere of his new "faith-based" film Revelation Road 2: The Sea of Glass and Fire, in which he co-stars with Sting (the wrestler, not the singer). Of course the World asked The Boz his thoughts on the state of Oklahoma football, and he was obliged to respond. "Tulsa World: Some talk about “feeding the monster” that is Oklahoma football. Is OU just as big a “monster” or even bigger than when you played? They don’t come to Oklahoma because they want to make Oklahoma their dream. It’s not like they’ve been six, eight, 10 years old and dreaming of wearing crimson and cream. They’ve been six, eight and 10 and they have been playing NFL Madden Football. They are not there to continue a tradition. They are there to start their career." Bosworth says things can be turned around for the Sooners, citing among other things, Kevin Sumlin's first year as Texas A&M head football coach. That may or not be a swipe at Sooner HC Bob Stoops, who lost to Sumlin, the Aggies, and that Johnny Football guy in the Cotton Bowl this past January. It certainly doesn't sound like a ringing endorsement of Stoops.